And like many modern day couples, Niamh and Hari met on Tinder! Hari had come to Dublin on tour with the musical Chicago (he was the trombonist) and offered Niamh tickets to see the show. When they got to speak to each other they 'realised quickly that we were meant to be together', and so began 12-months of trips between Dublin, London and Cardiff culminating in Hari’s big move to Ireland in summer 2017. 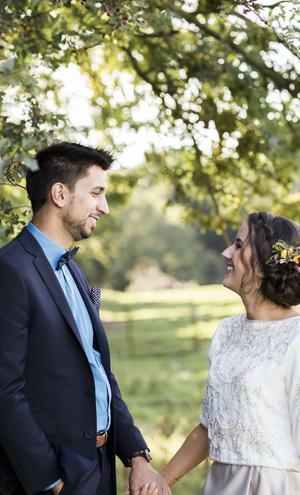 Hari popped the question on a particularly mucky walk with their dog Lili on the banks of the Boyne River in Slane earlier this year: "We came around a corner to beautiful January sunlight coming through the trees and Hari got down on one knee. He later told me that he was waiting for a quiet moment where no one else was around. An unexpected group of kayakers on the river almost ruined it for him!" 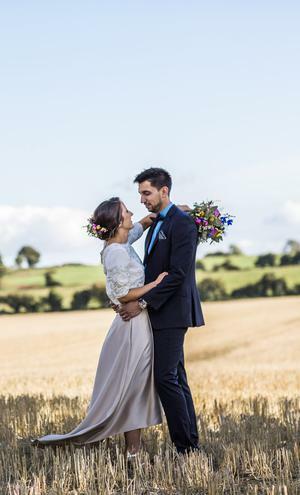 They tied the knot in a small and intimate humanist ceremony on Rock Farm, Slane in early September, DIYing lots of the gorgeous decor and details for the day. 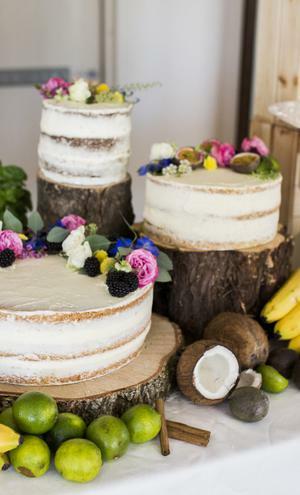 Niamh, who alongside her day job runs her own cake-making business Baked by Niamh, made several stunning (and by all accounts delicious) cakes for the occasion, in flavours such as prosecco blackberry and zesty tropical lime. Their flowers were done by 'a very dear family friend'. Guests were spoiled with their choice of food and drinks on the day - with the couple putting together a nostalgic 'Coke Float' and fun 'Pimp your Prosecco' station (more on that below) and Rock Farm serving up 'grazing plates' of locally produced charcuterie and cheeses to ensure nobody went hungry. Niamh's wedding ‘dress’ was actually separates - a skirt and top - which she found in Folkster in Temple Bar. 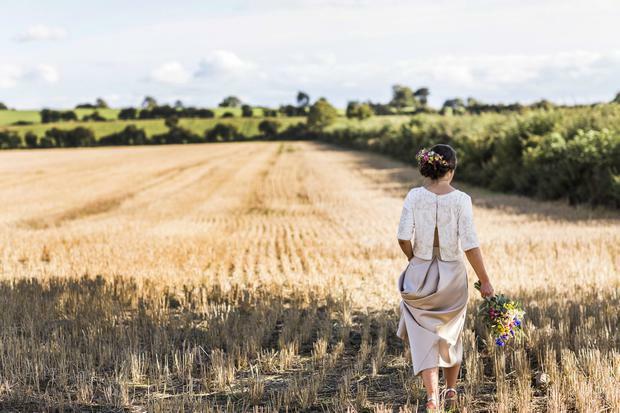 "I knew I didn’t want to wear a conventional wedding dress so I had made an appointment with a vintage dress shop and planned a day out in town with my mam and bridesmaids" she explains. "When I tried on the outfit in Folkster I knew almost straight away that this was the outfit for me. I went home, slept on it, and headed back into town the following morning to buy it! It was elegant, unusual, comfortable and very me. My favourite features were the beading and embellishment on the top - and that the skirt had pockets!" 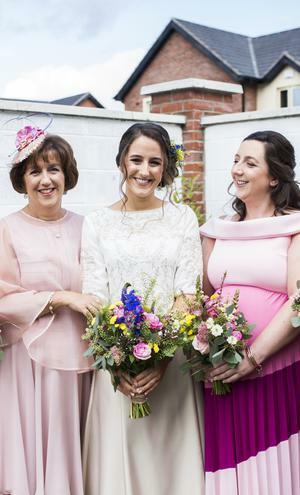 Wearing ASOS, Niamh's bridesmaids nailed the mix and match look on the day which they styled within a pink palette. Happily, Hari already owned his suit, having purchased it in Henry Jermyn in Dublin for a wedding the week they first met! 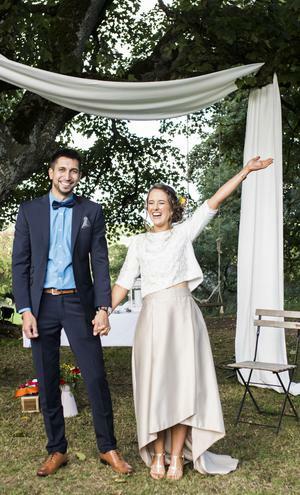 He accessorised it with brown brogues and matching belt, a sky blue shirt and cute dicky bow: "It was tricky for me to communicate to him that a less formal style would match my outfit better, without revealing that my dress was not conventional!" 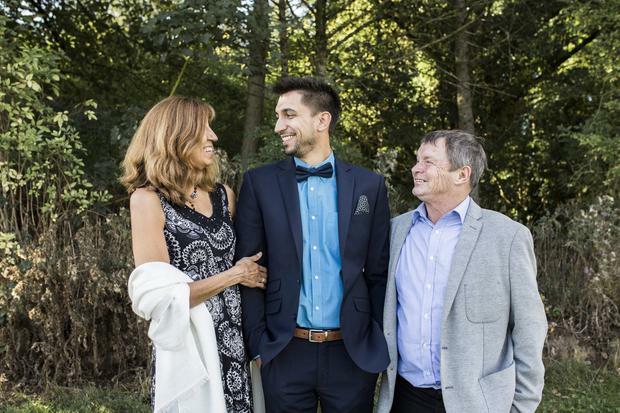 Niamh and Hari had a humanist wedding ceremony celebrated by Joe Armstrong, which took place outdoors on the grounds of Rock Farm; "It was important to us that we would have a ceremony that would align with our own world view, and be inclusive and meaningful for us and all of our guests. 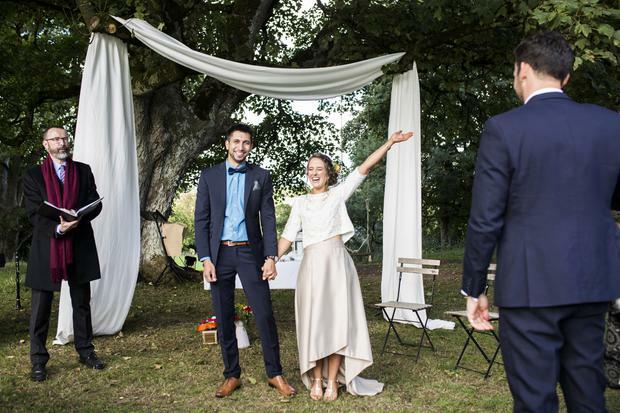 I had previously been to a humanist wedding and found it deeply personal." The ceremony also included a 'wine ceremony' whereby they sealed love letters and a bottle of wine into a box - which Hari had actually built out of our left over living room flooring - to be opened on a future anniversary. "We enjoyed being able to pick our own rituals which aligned with the complexity of our families situations," says Niamh. Their readings included a Seamus Heaney poem, an extract from a favourite childhood book, a poem about love, and an interpretation of ‘How falling in love is like owning a dog’ by their friend Jules. Niamh and Hari's wedding was held on Rock Farm in Slane, with their reception in the farm's on-site entertainment venue Lime House. 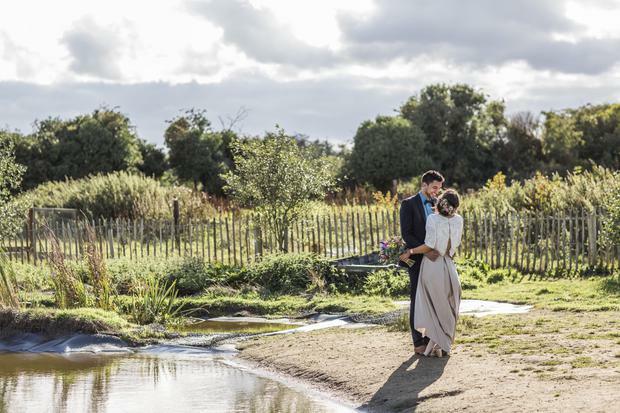 "Our initial two ideas were to try and have our wedding ceremony by the river where we got engaged, and to have our reception in a big house where our guests could stay over rather than a traditional wedding venue," Niamh explains. "These two ideas aligned when we found that Rock Farm owned the land we had been walking on, and they had the fabulous Lime House which looked perfect for our needs. 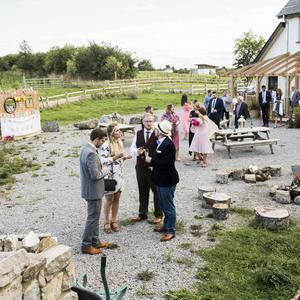 When we went and visited Rock Farm we were overwhelmed by the gorgeous scenery, the ceremony area outside under a huge tree, and the wonderful Lime House with its huge entertaining space (which included a huge outdoor area complete with a campfire area and a hot tub!) We loved the friendly and laid back approach of the staff, even making a fuss of our dog and assuring us she was welcome at the wedding without us even asking!" The couple say they were 'blown away' by the attentiveness, care, attention to detail of the staff at Rock Farm: "Many of our guests commented to us about how friendly and attentive the guys were during the drinks reception and dinner service. The team were genuinely a pleasure to work with, without exaggerating I ended up feeling like they were very much part of our wedding celebration. " 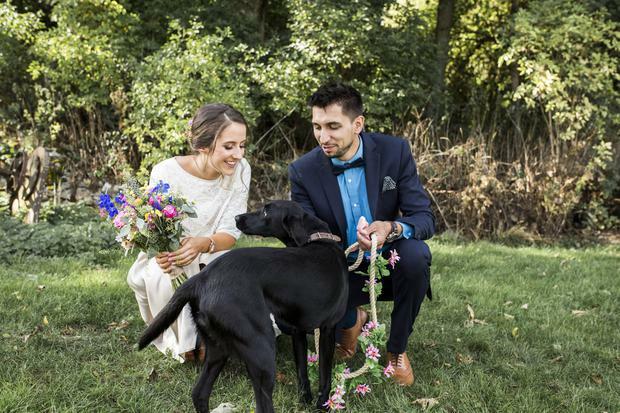 The couple's day was sprinkled with lots of beautiful DIY details, from their specially made ceremony arch to their dog Lili's floral lead! 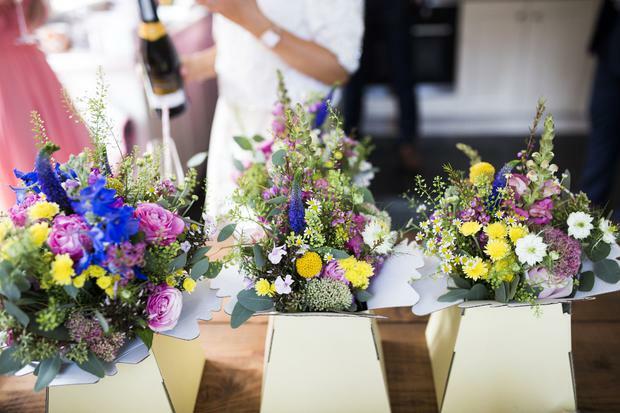 Hari handmade their wine ceremony box and wedding arch (with fabric from IKEA) while Niamh dressed the dog lead in artificial flowers, created confetti by drying rose petals in the oven, and even made a special Elderflower cordial for their Pimp your Prosecco table. 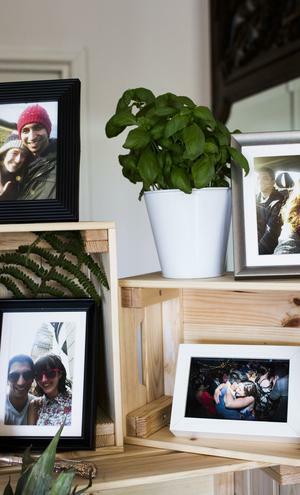 "We decided that our room décor would be based on a few basic elements," explains Niamh, "but that there would be plenty of them! We collected recycled jam jars and used them with tea lights, recycled wine bottles which we used as vases for ferns that we collected from nearby woods, bunting and fairy lights. 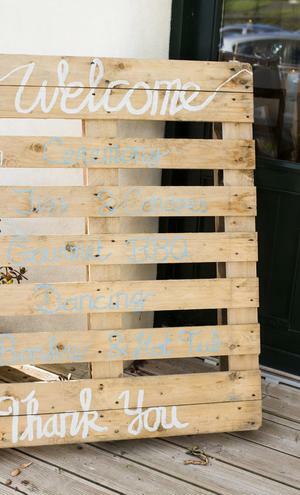 They hand painted signage for the venue from pallets sourced from a builders merchant, and Hari even knocked up a last minute sturdy music stand as they worried the wind might blow over a normal music stand! "I spent most of my energy in wedding planning on crocheting bunting! We wanted to add splashes of bright colours all around our reception area and the bunting really did the trick," she says, "plus, we sourced 150 metres of fairy lights from Aliexpress and we hung them all around our reception area, inside and out." Inspired by a garden they had seen at Bloom over the summer, Niamh planted small bedding plants into tin cans for the table decor;"The tins went rusty," she admits, "but we felt this actually added to our rustic vibe!" Part-time baker Niamh says she always knew she would make her own wedding cake. "I really wanted to wow our guests with delicious cake so spent some time perfecting the flavor combinations and recipes. The cake flavours were: Hummingbird: an indulgent pineapple, banana and pecan spiced sponge with tangy cream cheese buttercream; Tropical Vibes: A zesty lime sponge with homemade passionfruit curd and creamy coconut buttercream; Prosecco and Blackberry dream: a Prosecco soaked sponge with homemade blackberry and basil jam, and mascarpone and vanilla bean buttercream. Delish! Hari measured up the sizes of each cake and contacted a local tree surgeon to cut us the sizes to make a rustic cake stand, and after, he decorated the table with elements of the flavours featured in the cakes. "Our coke float station was one of our favourite original ideas and our guests loved it! We sourced some tin buckets from a builders merchant, filled them with ice , cans of coke and ice cream and let out guests help themselves. Extras included sprinkles, marshmallows, squirty cream and rum!!" "It’s so hard to choose a favourite moment," says Niamh, "I just remember smiling and laughing all day, my sides were so sore from laughing by the time we went to bed! The ceremony felt dream like and seemed to go by so quickly. I loved walking up the aisle with my Mam, and later when we signed the register it was a strange moment because we were on a high, but at the same time, Hari’s friends Jim and Ben were playing my late grandmother Betty’s favourite song, When I fall In Love by Nat King Cole, so when I looked up all I could see was my family in floods of tears!" 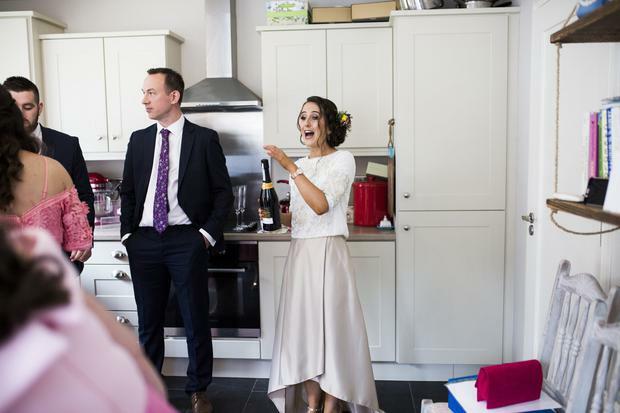 "We also loved our speeches, we spread them out over the course of the reception and had mentioned to our family and friends that anyone could make a speech if they wanted to. 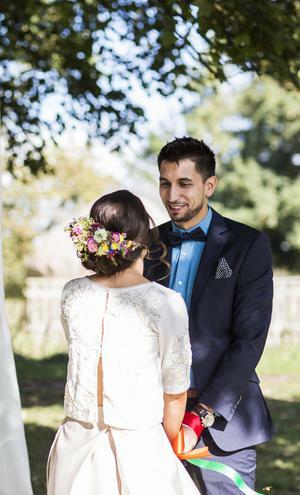 My mam and sister Caitriona and Hari’s best man Max made lovely heartfelt speeches which made us feel so very loved." While the couple say they wouldn't change a thing about the day, that's not to say things didn't go wrong! "At about 10pm that Hari had not been wearing his buttonhole all day! I went and found it in the venue fridge along with his mum’s corsage and best man’s buttonhole. I went around pinning them on and we had a great laugh about it! The funniest part is that our florist is a family friend, and had been sent a photo of us, and noticed straight away that the buttonhole was missing. She was worrying the whole day that there had been an issue with it!" "My advice would be to think about what it is that you want to do on your wedding day," says Niamh. "There is a lot of pressure and expectation put on couples getting married, in terms of all of the extras that are perceived to be necessary. Think about the most important elements to you and put your efforts into them. Don’t get caught up in the tiny details that no-one will notice." 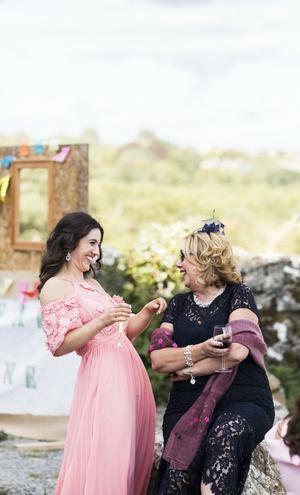 Photographer: Carol Sweeney Photography | Celebrant: Joe Armstrong | Venue: Rock Farm, Slane | Wedding dress: Folkster | Suit: Henry Jermyn | Shoes: Kurt Geirger | Accessories: Earrings by Lulu and Belle, watch by Cluse | Engagement ring: Chupi | Wedding ring: Chupi | Bridesmaids' dresses: asos | Decor: DIY | Reception: The Lime House, Rock Farm | Cakes: Baked by Niamh | Hair: Dovile Hair and Make-up | Make-up: Beauty by Asta | Flowers: "A very dear family friend"